There's no shortage of superhero comic book stories in our times, both on the big and small screen, though Netflix is likely feeling a little light on that front these days after cancelling most of its Marvel series in the past few months, thanks to the troubles that come with using a property that's ultimately owned by someone else, in this case Disney, which will soon be a competitor in the genre. Thankfully, the sheer abundance of illustrated material means there's no shortage of potential adaptations, albeit not as recognisable as the likes of Daredevil, which is good news for streaming outfits always on the prowl for more original content. Created by Gerard Way, the frontman of the now-disbanded My Chemical Romance, and Brazilian illustrator Gabriel Bá in 2007, the award-winning comic book series The Umbrella Academy is certainly a promising candidate. It has half a dozen superheroes with a variety of powers that make up the titular group, which makes for a ripe family drama, it has an outlandish premise and strange, inexplicable events — the Eiffel Tower is revealed to be a spaceship in the opening pages, for instance — and it has a talking chimpanzee. 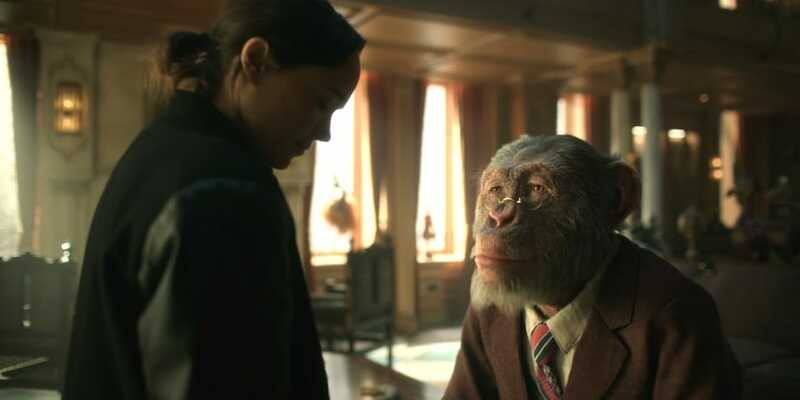 Netflix gave The Umbrella Academy a series order in late 2017, after it spent years in development hell being worked on as a film, and tapped Ellen Page (Inception) to lead the cast. The finished product — the 10-episode first season of The Umbrella Academy arrives February 15, 2019 on Netflix — unfortunately doesn't have much going for it. The central plot point of having to thwart an imminent global apocalypse is such a super-cliché for the superhero genre that Page herself has been here before, being a part of the star-studded and critically-acclaimed X-Men: Days of Future Past in 2014. (This is a little like the X-Men too, as you will see.) And for reasons not entirely clear, the show — created by Steve Blackman, an Emmy-nominated producer on Noah Hawley's Fargo series — sheds the vibrant colours and some of the fantastical elements that gave the comics its wacky feel, leaving behind a production with a dour, gloomy aesthetic that makes it feel as generic as many others. For what it's worth, The Umbrella Academy wastes no time in setting up its premise as we open: 43 women randomly gave birth on the same day in late 1989 around the world, having shown zero signs of being pregnant when the day began. Seven of the children were adopted by an eccentric and reclusive billionaire named Sir Reginald Hargreeves (Colm Feore, from Bon Cop, Bad Cop), who brought them together to fight evil and save the world — under the moniker of the ‘Umbrella Academy' — while he kept himself emotionally distanced to the fullest. Instead of naming them, he numbered them in the order of their usefulness. The family was fractured during their teenage years and all chose to go their separate ways, but they reunite after their father dies in present day. Page is Number Seven aka Vanya, a violinist who's the only one without superpowers in the Hargreeves family. She was not included in most activities owing to that, and she's grown up with a grudge towards the rest. Then there's Number One aka Luther (Tom Hopper, from Black Sails), superhuman in size and the most dedicated and loyal of the lot to their father, who spent four years on the Moon. Number Two calls himself Diego (David Castañeda, from Sicario: Day of the Soldado), a masked crime-fighter who can do magic with knives. Number Three aka Allison (Emmy Raver-Lampman) is a movie star thanks to her ability to convince anyone of rumours, Number Four aka Klaus (Robert Sheehan, from Misfits) is a drug addict who can talk to the dead, and Number Five (Aidan Gallagher) can teleport and time travel. The Hargreeves household also consists of the talking chimpanzee who's called Pogo (voiced by Adam Godley, from Powers), assistant to and caretaker of their father, and their android mother Grace (Jordan Claire Robbins). For much of the first season — critics, including us, had access to seven episodes — the antagonists of The Umbrella Academy are a pair of time-travelling assassins known as Hazel (Cameron Britton, from Mindhunter) and Cha-Cha (Mary J. Blige, the singer-songwriter who was in Oscar-nominated Mudbound). In the comics, Cha-Cha is male. They are after Number Five, who had been missing for nearly two decades before their father's death, but miraculously shows up out of the blue, claiming he's seen the end of the world that's due in eight days' time. An imminent apocalypse — one due in just over a week — ought to give any show a sense of urgency, which should work wonders for pacing and narrative. But surprisingly, it adds zero urgency to the events unfolding on screen. Most of the Hargreeves want nothing to do with the apocalypse — for some, it fits in with their personality — and that renders them passive for too long on The Umbrella Academy. It would work if they had better storylines crafted for them, but that's not the case. Luther just broods around the house for the most, Diego's subplot suffers from the ‘fridging' trope, Klaus is mostly forced into other narratives, and Allison's only job seems to be to dig dirt on Vanya's new love interest, Leonard (John Magaro, from Overlord). Five is easily the most active of the lot because he's the only one trying to figure out how to prevent the impending catastrophe. That's also partly because Five thinks that he must do everything himself, having lived much longer than his siblings due to the nature of time travel and seen them fail once in the future. That also makes the character a little know-it-all, but the 15-year-old Gallagher — Five is stuck again in his teenage body when he returns to present day — handles the screen time he gets fairly well, given he has to play someone who is mentally a lot further than his years. Additionally, Britton and Blige get to do more on The Umbrella Academy, than the rest of the lot. One of the show's few good moments comes early in the first episode, when the Hargreeves family randomly starts dancing to a song from their childhood — Tiffany's 1987 pop hit “I Think We're Alone Now” — each alone in their own quarters. Its composition, like a giant dollhouse cut open, is reminiscent of a Wes Anderson flick (think a more emo, gothic Royal Tenenbaums), but there's little of that offbeat charm elsewhere. The Umbrella Academy loves scoring its action to famous songs from across the decades — Queen, They Might Be Giants, Paloma Faith, The Kinks, The Hollies, The Yardbirds, Morcheeba, David Gray, and Toploader all make an appearance — but it doesn't have anything of its own to match their brilliance. There's plenty of good material to mine here, from Vanya's desperation for being loved, Luther's want for approval, Allison's insecurity, Klaus shielding himself from feeling, Diego thinking he has a point to prove, and Five untrusting of anyone else, in addition to the foster siblings' collective parental issues. But the writing is too threadbare and inconsistent to bring that up in an affecting manner. And like some among them, The Umbrella Academy is too pompous for its own good to realise the inherent emptiness. Set aside the fate of the world, this bunch of superheroes should try saving their show first. The Umbrella Academy is out February 15 on Netflix. product The Umbrella Academy, Netflix’s series adaptation of Gerard Way and Gabriel Bá’s comic book of the same name, is about a dysfunctional family of superheroes trying to prevent the apocalypse. The Umbrella Academy is released February 15, 2019.